Lately, I have been pounded with a theme of challenges around the question “Why take part in Social Media if it takes up so much time and has such poor tangible results?” And my general response is, it should take as much time as needed to accomplish your business objectives which have been created to help you reach your goals. Top Five Social Media Marketing Mistakes? You know about all the wonderful things the blogosphere can do for your business. But how can you prevent the not-so-wonderful stuff? At the end of the day, brands must earn their “social currency.” There are no shortcuts or substitutes to authentic engagement in the realm of social media. 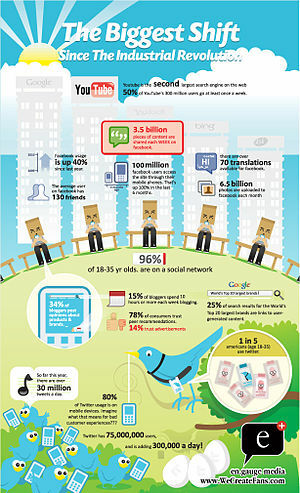 via Top Five Social Media Marketing Mistakes – BusinessWeek. Unfortunately, I see many small or medium sized companies try their luck with social media and treat it like some shiny new toy that consumes all their attention, as they forget about all the other things they could be doing. I find they over tweet, over post, and over blog themselves to the point that they justify leaving the scene altogether because it’s not worth the effort for the little results they see. This is where I come in. I sit down with them and ask some simple questions. What activities, events, promotions, or other marketing objectives are coming up in the near future? After I have that list, I can then sit down with them and explain the role of each of the social media tools and how they can fit into the marketing plan for the upcoming several months. We also start by setting up measurements so that they understand where their leads are coming from. As a simple example, this may include a unique 800 number for each channel (print, tv, radio, and each site they are using – it’s not that expensive really) I explain how their phone bill or on-line phone records can then be used to measure campaign success, if inbound calls are one of the means by which we will measure the campaign success. Social media can be a valuable tool for small and medium sized companies. It can level the playing field quickly for a company that is dealing with a regional or national player, especially if these companies have their marketing and advertising plans controlled by corporate. Often these larger companies are incapable of adjusting to local pressure applied by small companies and their ideas. I’d love to hear of examples in which small companies attack the larger companies by using social media. Please share them in the comments.